Name: Mrs. Mary Terronez Address: 5315 W. River Dr., Davenport, IA. 52802 Phone: AC 319, 324-5621 Positon Desired: Outreach Worker- Spanish Speaking People's Commission Education: GED High School Diploma- Oct. 1975 Undergraduate sociology major at Palmer Jr. College, Davenport, Iowa with a 3.0 (B) grade point average. 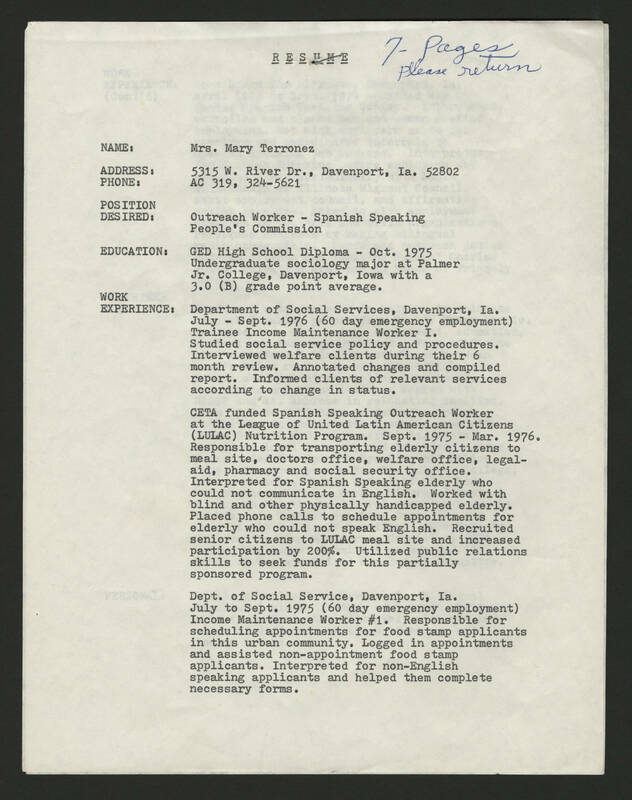 Work experience: Department of Social Services, Davenport, IA. July-Sept. 1976 (60 day emergency employment) Trainee Income Maintenance Worker I. Studied social service policy and procedures. Interviewed welfare clients during their 6 month review. Annotated changes and compiled report. Informed clients of relevant services according to change in status. CETA funded Spanish Speaking Outreach Worker at the League of United Latin American Citizens (LULAC) Nutrition Program. Sept. 1975-Mar.1976. Responsible for transporting elderly citizens to meal site, doctors office, welfare office, legal aid, pharmacy and social security office. Interpreted for Spanish Speaking elderly who could not communicate in English. Worked with blind and other physically handicapped elderly. Placed phone calls to schedule appointments for elderly who could not speak English. Recruited senior citizens to LULAC meal site and increased participation by 200%. Utilized public relations skills to seek funds for this partially sponsored program. Dept. of Social Service, Davenport, IA. July to Sept. 1975 (60 day emergency employment) Income Maintenance Worker #1. Responsible for scheduling appointments for food stamp applicants in this urban community. Logged in appointments and assisted non-appointment food stamp applicants. Interpreted for non-English speaking applications and helped them complete necessary forms.